For my daughter's third birthday in December we had a Snowman party. Invitations: I bought white paper snowman cutouts (die cuts) from a teacher supply store and my daughter colored" each one with markers. Then I folded snowflake-print paper from Michael's to make the invitations glued two snowmen on each invitation and put the party info on the inside. Decorations: I had snowman-themed plates cups and napkins and a blue tablecloth with a clear snowflake-print cloth on top of it. Over the table I hung white glittery plastic snowflakes from the party store dangling down off of threads (I tied them to the ceiling light fixture). In the living room I had blue and silver Mylar balloons tied to the chairs stair railing etc. I also bought strings of blue-and-silver Mylar snowflakes from Oriental Trading and taped one end of each string to the top of the wall so that the strings of snowflakes were dangling down the walls all around the room --this really looked great. Games: For a craft project I had a table set up with sheets of light blue and white construction paper pans of dark blue and white paint snowflake sponges (Michael's) and glitter to sprinkle on the snowflake prints while the paint was still wet. This activity was very popular! Be sure to lay a sheet on the floor under the art table because of the glitter. Besides the craft project the children also played "Pin the Nose on the Snowman and I handed out prizes of snowflake pencils and snowman hair ties from the drugstore. Finally, we read The Snowy Day" by Ezra Jack Keats (in a big-book version from the library). Favors: I made "snowmen" out of socks --these took some time but were really cute! Probably the hardest part was finding true tube socks with no heel. I finally found inexpensive white nylon socks with no heel at Payless. In the bottom (toe) of each sock I put a color-your-own snow globe kit some snowman stickers and a snowflake stamper all from Oriental Trading. I wrapped them in white tissue paper to make them rounder and less lumpy. This was the snowman's body. Then I made a (removable) neck by wrapping a brown pipe cleaner around the sock --this made the snowman's arms. In the top part of the sock I put a baggie full of candy (blue M'n'M's and silver Hershey Kisses) again wrapped in tissue paper to make it smoother. This was the head. I then tied the top of the sock with a bit of white ribbon and covered the place where it was tied with a little hat made of a cone of bright colored felt held together with hot glue. On top of each hat I glued a little white pom-pom. The hats were removable not glued on. Finally the snowmen were finished with bits of felt for eyes noses and buttons (hot-glued) and fringed felt scarves (just tied on). 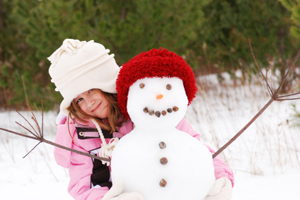 At home the children could remove the hat and the pipe-cleaner arms take out the goodies and re-assemble the snowman doll by stuffing it with tissue paper or cotton balls. I thought about three-part snowmen but it turned out that two-part snowmen looked just fine and were much more stable. Cake: I made a two-part snowman out of a 9-inch round cake and a 6-inch round cake. This was too big for a regular tray so I used a big board covered with foil. I frosted the cake with whipped cream but you could also use regular white frosting. The decorations were entirely edible: a pink flat-bottomed ice-cream cone for a hat Junior Mints for eyes a triangle-shaped piece of orange taffy for the carrot nose (alternatively you could use a short piece of orange stick candy) a row of red M'n'M's for the mouth (don't do the mouth too far in advance --the M'n'M's will bleed) round peppermint candy cheeks a red fruit rollup scarf pretzel log arms and three red Lifesavers for buttons which also served as holders for the birthday candles. I put Happy Birthday in red icing on the bottom of the snowman under the buttons. The cake looked great with the glowing candle buttons and it really was easy since it involved no cutting and no complicated icing just a few candy decorations. Food: Besides the cake I served sandwiches cut out with a snowman cookie cutter, cheese and crackers, carrots and grapes, chocolate milk, vanilla ice cream cups with blue sprinkles and blue finger jello (the recipe is on the box) cut out with an angel cookie cutter to make "snow angels." The blue jello angels were a huge hit --so much that I might as well not have bought the ice cream!"